AES Bord na Móna have today announced new charity partners for the year ahead. Pieta House and The Jack & Jill Children’s Foundation will receive 1% of all online bill payments of €20 or more made by their customers throughout the year. Last year alone this amounted to €80,000 for Our Lady’s Children’s Hospital, Crumlin, and Temple Street Children’s University Hospital. 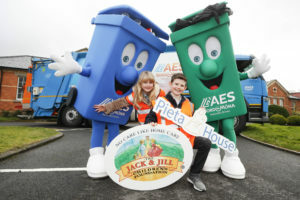 Speaking at the launch in Newbridge, Ciaran Brady, Head of Resource Recovery in Bord na Móna said, “I am delighted to announce today that we will be working with Pieta House and Jack & Jill Children’s Foundation who have become our official charity partners for the year ahead. AES Bord na Móna is rooted in communities right across Ireland where we provide waste collection services to over 106,000 customers. Our customers enable such wonderful partnerships by making online account payments of €20 or more and we then donate 1% of that to such amazing charities. Karen O’Shea from Pieta House was also at the launch, and speaking on the day said: “Pieta House provides a free, therapeutic approach to people who are in suicidal distress and those bereaved by suicide, available to all through their centres across the country and freecall helpline 1800 247 247.The generous support of AES Bord na Móna will help us further throughout the year”. Mr Brady concluded: “Both Pieta House and Jack & Jill Children’s Foundation are also rooted in communities, providing much needed services to families right across the areas we serve. AES Bord na Móna are privileged to be in a position to enable our customers support the vital work and much needed services that both organisations provide. Since the start of the initiative, we have been donating to two very worthy causes – Our Lady’s Children’s Hospital Crumlin and Temple Street University Children’s Hospital. To date we have raised over €265,000 for these hospitals; only made possible by AES Bord na Móna customers. I look forward to the year ahead with our new partners.